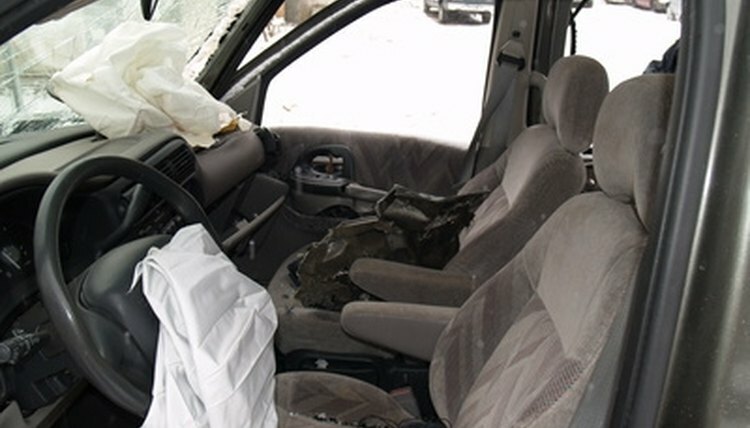 Getting into a car accident can be devastating. In just a matter of seconds, your life is altered. At the least, your schedule has been waylaid, your car is damaged and you have the hassle of police reports and insurance claims to deal with. At the worst, you or your family has been seriously hurt, your car is totaled and you're in financial straits. Being financially compensated for an auto accident that wasn't your fault is your legal right. Calculating how much is owed to you is based on a number of factors. Gather real expenses incurred as a result of the accident. Medical bills, both present and anticipated future bills, are the largest contributing factor in determining an insurance settlement. Obtain a copy of them from your doctor or hospital along with a written statement from your doctor if continued medical is needed. Calculate the amount of wages you have lost as a result of the accident. Proof that you are unable to work is necessary to verify this amount, such as a note from your doctor. Calculate a decrease in future earnings, if applicable. If you've been seriously injured, for instance, and can no longer fulfill your duties at your current job, you can add future wage losses to your settlement request. Apply the cost of your vehicle's repair to your calculations. Use the repair estimate provided by the auto shop currently working on your vehicle. If the vehicle was totaled, add the amount that the car was worth. The insurance company will tell you how much your car is worth; however, check with several different sources. Insurance companies are required by law to give you a fair quote, but are likely to serve you with one below market standards. Combine these amounts to begin estimating what your settlement will be worth. Insurance adjusters use a formula to decide how much to pay a victim in general damages, such as mental anguish and pain and suffering. If the accident was minor, multiply your current total by two. If it was serious, multiply your total by five. If it was grave, multiply by 10. These totals are the amounts the insurance company is likely to settle your claim for. Julia, Brooke. "How to Determine How Much I Should Get in an Auto Accident Settlement." , https://legalbeagle.com/6510069-determine-should-auto-accident-settlement.html. Accessed 21 April 2019. What Does "Adjudication of a Claim" Mean?